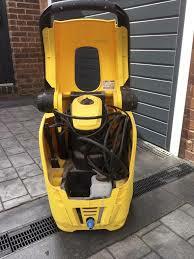 Pressure washers are the most effective way to clean outdoor areas and are extremely easy to use: connect the unit to a water supply and power outlet, turn on the tap, switch on the pressure washer and let the cleaning fun begin! You can easily adjust the water pressure by turning the Vario Spray Wand and also by moving closer to or further away from the surface you're cleaning. Encounter an area that's difficult to clean? Use the Dirtblaster Spray Wand. Combined with accessories, pressure washers are transformed into real all-rounders: for everything from deck to gutter cleaning, the possibilities are virtually unlimited. Looking for more tips? Our examples show how you can achieve the best cleaning results with your pressure washer. Mobile Pressure Washer with 1700 watt long-life Induction Motor producing 120 bar maximum pressure and a rated pressure of 110 bar with a water flow rate of 380 litres per hour. It comes with 6 metres of high-pressure hose, a Trigger Gun, Variable Pressure Lance. This Next Generation Compact Design has a foldaway handle for easy transportation, In-built detergent tank and Internal Accessory Storage.